Northern America is the the most fantastic location for a horse riding holiday! Unicorn has a huge range of trips for you to choose from in both the USA and Canada. The USA must be one of the most famous places in the world to go on a riding holiday mainly because of the cowboy culture and ranch holidays in the United States. We offer a large selection of ranch holidays suitable for beginners onwards and all offer really good, faster riding for experienced riders, unlike many ranch holidays on offer from other suppliers. But to limit horse riding holidays in the USA to ranch holidays would be only part of the picture, so we offer three exciting point to point horse riding holidays in the spectacular South West. Covering Arizona and Utah, Monument Valley, Grand Canyon, Navajo Indian culture and much more, these horse riding holidays offer an insight onto a spectacular part of the USA best explored on horseback. As most riders already know so much about the United States of America, what more can Unicorn Trails do to tempt you to choose a horse riding holiday here? Think Grand Canyon, Old Faithful, Rocky Mountains and miles of wilderness. The diversity of geography, flora, fauna and climate is huge. Many people opt for ranch holidays in USA but we also include some fabulous riding trails in our US range. Wyoming is the 'Cowboy State'. Ranching is still a key industry here, and one of the world’s largest rodeos – Cheyenne Frontier Days, is held every July. The guest dude ranches are ever popular and Unicorn's rides here are both ranch holidays. Set in the middle of the Bighorn National Forest in Wyoming is the wonderful Moose Ranch. If you are looking for a wonderful ranch experience in a remote setting surrounded by nature and wildlife with some cattle work then look no further. There are 18 very solid spacious log cabins with views and verandahs. As so often on USA ranch holidays there are many non-riding activities and entertainments to suit everyone such as heated swimming pool, hot tub, guided and unguided fly fishing and lots of evening fun with singing around the campfire, square dancing and cookouts. In addition to the extensive horse riding program there is a fully supervised children's programme from infant onwards. Pack trips are also available into the surrounding wilderness areas. The welcome is genuine and the nature pristine. Almost everyone returns to visit here again. You'll be surprised by the diversity in Utah - national parks, ski resorts, Lake Powell, Salt Lake City to name a few. Our ride here is an adventurous camping trail that actually takes you through northern Arizona and southern Utah As suggested by the ride's name Utah, Three Park Spectacular, the trek goes through three of the Southwest's most amazing and truly stunning geological formations: the pink and orange hoodoos of Bryce Canyon, the red and buff labyrinth of Zion Canyon, and the multicoloured depths of the incredible Grand Canyon. The trail starts in the Pariah River Canyon, part of the nation's new Escalante Grand Staircase National Monument. This ride treks through remote, sparsely populated country so riders will encounter few, if any, other people during the course of the trip. We have a family run ranch holiday in Montana, Bridger Ranch. Your hosts have years of experience looking after guests. The ranch has been handed down through the family and the hosts are directly descended from the original homesteaders who actually carved this ranch out of the wilderness. They have inherited their love and knowledge of the surroundings and local environment and they impart this to the guests with lots of narrative tales and historical explanations. We know that all cowboys like their food and the meals here are fantasic, taken around the kitchen table. Most horses on the ranch are bred and trained with gentling methods. If guests are interested natural horsemanship clinics are available. Cattle work is undertaken for all the neighbours, so there is 22 square miles of territory to cover. On this ranch riding holiday in Montana you will be welcomed along with many others who have discovered this haven and return year after year to enjoy the riding, peace and hospitality. We offer a another dude ranch holiday in Montana, Sunrise Ranch. There are 120 Appaloosa/quarter horses available and different riding groups for every level of rider - beginners, intermediate and advanced. The location is stunning. The ranch is 7000 feet above sea level and is extemely remote, being surrounded by 2 million acres of wilderness. Old Faithful and Yellowstone National Park are only 1.5 hours drive away. The ranch is family run and welcomes families. It has a great children's program from infants to ten year olds, and plenty to do for the older children. If you like fishing as well as horse riding then you'll be interested in the excellent fly-fishing streams and the stocked casting pond. There's even a fly-fishing guide for guests. We have a fabulous riding holiday in the Grand Canyon in its winter pastures. This holiday is a rigorous horse pack trail and is definitely not to be confused with those infamously tedious donkey rides! We explore the Canyon's "Esplanade" these are wide terraces varying in width from 200 yards to a mile wide. In the heyday of the West's ranching era they served as a refuge for cattle from winter storms. Today thanks to the exquisite scenery and solitude, they are an inviting location for winter camping and exploring. The ride takes us to the least frequented drainages and the going can get rough so riders often need to dismount to lead their horses through particularly treacherous areas. Once the trail drops off the north rim, you are unlikely to come across more humas but there's always the odd bighorn sheep or sky mule deer. Even better you may catch sight of a condor soaring overhead. This riding holiday in the Grand Canyon is only for competent riders and you will appreciate the small groups when you ride in this 'mountain upside down' as the Navajo called it. Could there be a better winter sun escape? Adjacent to the Saguaro National Park we have our riding holiday called Arizona, Tucson Ranch, a family run ranch set in 5 square miles of desert. This is one of our premier horseback vacations. Guests love getting involved with the weekly cattle work. Experienced riders are catered for with brisk lope rides but less able riders, of all ages, are also welcomed.There are slow rides on the flat and also rides up into the heights of the Saguaro National Park. Families are welcomed here although there is no specific children's riding programme. As expected on a riding holiday in the USA, food is varied and plentiful and the accommodation is of a good spec and spacious with an outdoor pool and indoor hot tub. There are lots of non-riding activities and entertainment such as roping demos, barrel racing and shuffleboard. This is a great choice for a US ranch holiday. 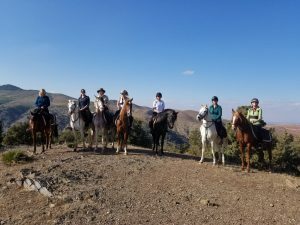 In addition to our and dude ranch in Arizona we also have a trail ride across the Navajoland of Arizona, with dramatic lanscapes and a unique culture. Today the Navajo is the largest Indian tribe in North America. Across the Navajo Reservation sheep and goats are declining and with them the rural lifestyle that bound the Navajo to their land. The Navajo's connection to their land has become more spiritual as many young Navajo move into towns to seek work. However, the Navajo have not abandoned their culture, they are just adjusting to insure their survival. Our trail here crosses three areas of the Navajo Indian Reservation, each very different. 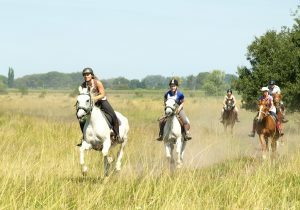 If you are a rider prepared to camp, without all the creature comforts then this is a perfect horseback holiday for you. We start in the Canyon de Chelly with its impossibly high walls in which are dotted Anasazi ruins. Then we continue to ride spending 2 days in Monument Valley famous for its natural arches, mesas and buttes. Contunuing on we ride to the foothills of Navajo Mountain, which is rarely visited. From this camp we can see hundreds of miles across a labyrinth of sandstone canyons draining into the Colorado River. Then finally, a really fabulous treat, we take a boat cruise on Lake Powell, stopping to see Rainbow Bridge revered by the Navajo. Colorado is a year round destination, famous for the high peaks of the Rocky Mountains and great hospitality. This state is home to three spectacular National Parks, native American ruins and ghost towns left over from the gold rush. We have an excellent dude ranch holiday here in Colorado called appropriately Colorado, Rocky Mountain Ranch and situated right on the continental divide, about 100 miles west of Denver. The ranch is surrounded on three sides by forest or protected land making an area the size of Britain to ride in with not a fence in sight. Every ride out from this ranch has a view to rave about. You'll also have lots of fun team penning the cattle each week. This is a family friendly ranch and it has a fully supervised children's programme as well as a particularly good range of non-riding activities. However, if families aren't your thing then the last 2 weeks from the end of August are always designated adult only weeks. Unicorn has horse riding holidays in several areas of Canada. Canada is a truly huge country - the second largest country in the world by area after Russia and occupies almost 7% of the world's land mass. It is a country known for its mounties, maple syrup and lumberjacks - and has a cowboy culture similar to the USA. It's known for having the longest coastline of any country in the world - over 220,000 km. The Pacific Ocean laps on its western shores and the Atlantic Ocean its eastern shores. To its north lies Greenland and the polar ice cap. The lower 48 states of the US are to the south. Canada is a perfect blend of the best of Europe mixed with the best of the United States. The great praries are situated in the centre of this vast country with the Rocky Mountains to the west and the Great Lakes to the south east. Canada has a series of National Parks, and when you consider the size of this gigantic country you'll soon realise that you can ride all day without seeing another soul. Unicorn has horse riding holidays in Alberta (in the west) and Quebec (in the east) provinces. They cater for all riding abilities from beginner to advanced and those who love a challenge and want to ride fast. Non-riders and families are welcome on some of the holidays. Single riders will love the various trails we have or perhaps even the Alberta Working Ranch. Most rides have weight limits but our pack trips and ranches have horses for the heavier rider. These ranches also welcome children, making a great family riding holiday. If you prefer to ride western style then you'll find a perfect riding holiday in Canada. Beach riding is always a great favourite with Unicorn clients and in Canada we offer riding vacations with gallops along the coast. Why not come for the glorious Fall or a truly white Christmas? Quebec represents the French culture of Canada, and, located in the south east, is Canada'a largest province. Its historic capital city is also called Quebec, though Montreal has a larger population. Here you'll find the Hudson Bay, over a thousand lakes, the St Lawrence river, craggy mountains, tundra and 3 national parks. In summary - beautiful riding country. This is where French is the first language of choice and the ambiance and cuisine is definitely very French. In the north of the province you may be lucky enough to experience the great caribou migration. Come on the Snowy Landscapes riding holiday for a winter wonderland experience. To start, you'll stay in a warm and cosy inn situated on the summit of a peak in the Appalachian Mountains. Ride out on forest trails or deep powder snow to trappers' cabins, villages, mills and farms. Transfer to a traditional Quebec-style cedar shingled farmhouse and barn and under the starry winter night sky enjoy a magic excursion in a sleigh drawn by two superb Clydesdale draft horses. There are many surprises on this riding holiday - a trapper will teach you dog sledding, you'll have lunch in a teepee, you can try your hand at snow-mobiling or snow-shoeing. Fancy a thrilling toboggan descent? For the less energetic just relax in front of the crackling wood stove, chill out in the steaming jacuzzi or take a hot stone massage. Another bonus - the food on the riding holiday is fantastic. This holiday makes a wonderful Christmas escape. Canada is a delightful country full of friendly people all out to help you get the most from your horse riding holiday. This centre-based stay is an ideal alternative to a longer trail ride through the area such as the Snowy Landscapes or the Autumn Highlights, although it may be possible to arrange a mini-trail (just out for one or two nights) for small groups of up to 3 people. Perhaps you'd like to camp in a teepee. Accommodation is in comfortable lodgings, the country inn /ranch has single and double rooms, most en suite. The Inn also has a hot tub/jacuzzi and can arrange massages. The food is a real feature of this ride provided by a French trained chef. Most of the flavoursome produce is home or locally grown. The Inn's restaurant is very popular with locals. Horses are Quarter horses, Appaloosas or Canadians, all good natured and gentle and perfectly adapted to the terrain. Some are more spirited and there are some real schoolmasters. The riding is adapted to the ability of the riders and can vary from a gentle walk to riding at all paces. The terrain is varied with gently rolling hills and soft tracks, woods and view points. English or Western tack is available. Canada is a family-orientated country and families are welcome at the ranch. Besides riding, or perhaps for non-riders, there is a lot to see and do in the Quebec area and we recommend hiring a car to get the most from your holiday. We are happy to arrange this for you, just ask at the time of booking. You can always extend your holiday and we are happy to make all the arrangements for you. In the US perhaps you would like to hire a car and drive to Yellowstone or perhaps you'd like a few nights at the Grand Canyon or perhaps a city stopover in Denver. In Canada we suggest a few nights in Calgary - particulary at stampede time, a week in the fabulous city of Vancouver, climb the CN tower in Toronto, visit Montreal or Quebec City or take a trip to Niagara Falls on the Canadian / US border. Whatever you have in mind, we can make all the arrangements for a hassle free trip.